As August draws near, the sense of urgency to prequalify for spots in the DerbyWars NHC Qualifiers grows more intense by the day. The first of five DerbyWars NHC Qualifiers is set to take place on Saturday, August 3; subsequent qualifiers will take place each Saturday of the month. With just eleven spots in each DerbyWars NHC Qualifier, prequalifying tournaments offer an affordable way to handicap your way into a very competitive chance to secure a highly coveted seat to the NHC. As of Sunday, three more DerbyWars players are dreaming of Vegas. Fresh off a win in one of Sunday’s two early afternoon DerbyWars NHC Prequalifiers, Eric Moomey found himself sitting in the airport of Flint, MI, playing the evening prequalifying event. Indeed he wasn’t. After five contest races, it was time for Moomey to board his short flight to Baltimore, and he hadn’t so much as a penny in his bankroll. Without the benefit of Wi-Fi on the brief excursion, Moomey would be at the mercy of his preselected picks until he safely landed in Maryland. The news wasn’t much better when the plane touched down. Quickly checking the results, he would soon find out that he was still sitting on a goose egg through eight contest races, with only three betting opportunities left from Betfair Hollywood Park. 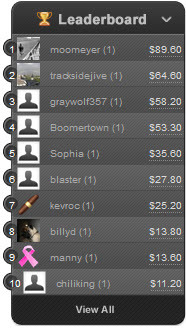 Booting home a cap horse late in the contest was good enough to get Moomey into a close third-place, just a few dollars behind the leader. But Moomey was still tasked with closing the deal to secure the second NHC Qualifier seat, a task that became tougher when his charge in the second to last tournament race failed to place. It had been well over an hour since the hopscotch flight had landed, but Moomey still found himself sitting in Baltimore Washington International Airport waiting for the final contest race to go before hitting the highway. He needed some money in the last race, and he needed a horse the two players above him wouldn’t pick. That strategy turned out to be a winning one as Life Rules streaked home on the inside to win the Betfair Hollywood Park finale in impressive fashion, adding $39.60 to Moomey’s bankroll and securing him a comfortable victory in the NHC Pre-Qualifier. 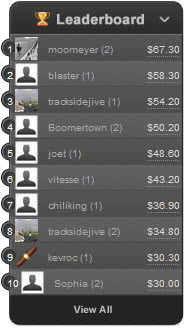 Since all DerbyWars NHC Qualifiers are limited to one ticket per player, Moomey becomes the first DerbyWars player to secure a spot in the August 10 NHC Qualifier, in addition to the place in the August 3 NHC Qualifier he had secured earlier in the day. Moomey went on to explain his win in the first NHC Prequalifier earlier in the day. 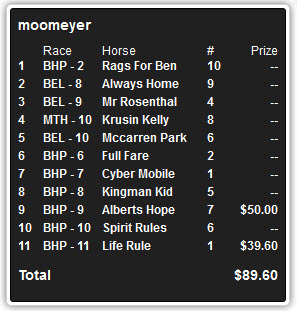 “I was looking for a price separator; I found it in the 3rd race of the contest,” explained Moomey. “Then I only needed to inch ahead of the two folks that came with me. They put up a good fight. I was able to successfully block them on the last race. 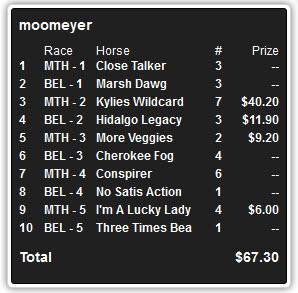 In addition to being a sage handicapper, Moomey is by all accounts a strategic whiz. He has spent years honing his prognosticative prowess and has started to see a significant financial payoff to the many hours of study. “If I do what everyone else does, we’ll just be duking it out,” Moomey astutely notes. He’ll be putting his skills to the test in the August 3 and August 10 DerbyWars NHC Qualifiers, but he hasn’t committed himself to a specific strategy just yet. Moomey is excited to play for a chance to win a seat in the NHC. Last year was his first trip to Las Vegas for the handicapping championship event, which he secured by finishing second in a free qualifier pitting 1500 handicappers against each other. A member of the United States Air Force, Moomey is extremely data driven in nature. It was a trip to the casino at Charles Town which got Moomey interesting in thoroughbred racing. Instead of playing on slots or other games of chance, the data-driven numbers-cruncher found handicapping the horses to be far more mentally stimulating. Moomey began playing in handicapping contests in 2010 and has been an active member of the DerbyWars community since the site launched in 2011. 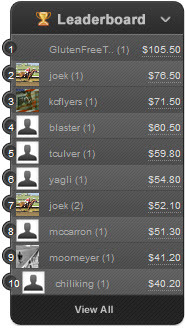 The final standings of the first DerbyWars NHC Prequalifier on Sunday indicate a $29 romp by Mark Scheider. 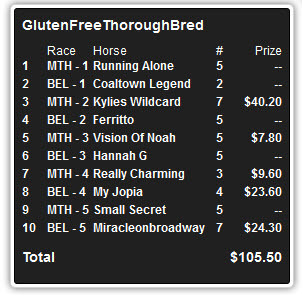 But going into the last race of the contest, Scheider led the field by just about $20 – not enough to be comfortably assured of a victory, especially in an eight horse finale peppered with live longshots. And hit it together they did. Miracleonbroadway streaked under the wire for the win and added $23.40 to Scheider’s already contest-leading bankroll, assuring him the contest victory and a seat at the table for the August 3 DerbyWars NHC Qualifier. That next step will come in just under three weeks when he competed against ten players for a coveted seat in the NHC. When asked about what strategy he might deploy against a compact field of tournament veterans, Scheider played coy. Scheider is a 32-year-old Marine veteran currently working in Manhattan. A relative newcomer to the sport, he was introduced to racing in 2010 by his late uncle Tom Scheider, who brought him to the racetrack. Scheider’s first trip to the Kentucky Derby was in 2011 when he advised friends and family to bet a chestnut colt named Animal Kingdom, only to miss the chance to place a winning wager of his own. He is an annual patron of the Belmont Stakes. good From the Kodi major menu, navigate to SYSTEM Add-ons Install From Zip. Click your KodiIsrael repo as well as install, best.